Apple Watch Gen 1 38mm Rose Gold Aluminum Case Series 7000. 3rd Party Pink Sand Nylon Loop. Activity and Heart Rate Monitoring Changeable Faces with Widgets. Bluetooth 4.0, 802.11b/g/n Wi-Fi Apple watchOS 3. Apple Watch Gen 1 42mm Space Gray Aluminum Case Series 7000. 3rd Party Olive Nylon Loop. 8/10 condition. Visible scratches on the screen. Fully functional. Apple Watch Gen 1 38mm Space Gray Aluminum Series 7000. 3rd Party Olive Nylon Loop. 8/10 condition. Visible scratches on the screen. Signs of wear on back. Fully functional. What's Included. Apple Watch Series 1 42mm Space Gray Aluminum. 3rd Party Olive Nylon Loop. Activity and Heart Rate Monitoring Changeable Faces with Widgets. Bluetooth 4.0, 802.11b/g/n Wi-Fi Apple watchOS. Aluminum Chassis with Ion-X Glass 1.3" 272 x 340 Display. 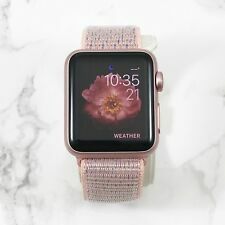 Apple Watch Gen 1 38mm Rose Gold Aluminium Case Series 7000 7/10. 3rd Party Pink Sand Nylon Loop. Activity and Heart Rate Monitoring Changeable Faces with Widgets. Bluetooth 4.0, 802.11b/g/n Wi-Fi Apple watchOS 4. Great watch that I've worn for the last year. Watch has passed extensive testing (connectivity, touch screen, wifi, battery life, etc) and is fully functional. Works great! 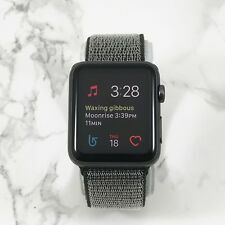 Apple Watch 1st Generation 38mm With Two Extra Bands And Charging Cable.. Condition is Used with MINOR surface scratches on face and back of watch. Works perfectly. Shipped with USPS Priority Mail. 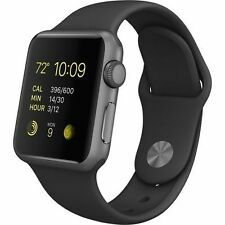 Apple Watch Generation 1 38mm Space Gray Aluminium Case Series 7000 7/10. 3rd Party Olive Nylon Loop. NO Apple Warranty. NO Original Box. Apple Watch Series 1 42mm 7000 Model Silver. Shipped with USPS Priority Mail. Comes with both bands in picture and charger. 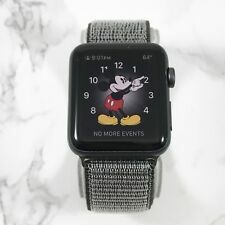 This is a Used Apple Watch Series 1 42mm Space Gray Aluminum MP032LL/A With Black Band. Apple watch series 1 42mm used. Condition is Used. Great shape, minor scratches only. Works like new. Original box, charging cable and s/m & m/l sport bands included. Shipped with USPS Priority Mail. 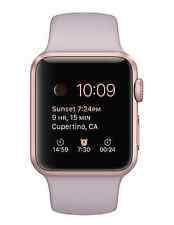 Apple Watch Generation 1 42mm Rose Gold Aluminum Case Series 7000. 3rd Party Pink Sand Loop. Activity and Heart Rate Monitoring Changeable Faces with Widgets. Bluetooth 4.0, 802.11b/g/n Wi-Fi Apple watchOS 3. Apple Watch requires an iPhone 5 or later. 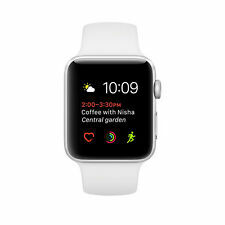 Classic Buckle, Leather Loop, Modern Buckle, Milanese Loop, and Link Bracelet bands are not water resistant. 1Apple Watch Series 1 is splash and water resistant but not waterproof.Durable, lightweight aluminum cases in silver, space gray, gold, and rose gold. Several minor nicks on case top, bottom. See photos for details. 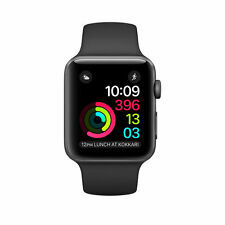 Apple Watch Series 1 A1803 42mm Space Gray Aluminum Case. Black Sport Band, size S/M (fits 130-180mm wrists ). No iCloud lock. Watch is in full working condition. It has been used in the past so it will show signs of wear, such as heavy scratches and/or scuffing. Trending at $111.31eBay determines this price through a machine learned model of the product's sale prices within the last 90 days. Apple Watch Generation 1 42mm Stainless Steel Case Series 7000. 3rd Party Seashell Nylon Loop. NO Apple Warranty. NO Original Box. 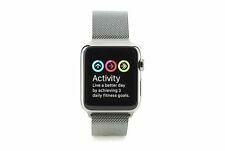 Apple Watch Series 1 42mm Aluminum Case Cocoa Sport Band - (MNNN2LL/A). Condition is Used. Shipped with USPS Priority Mail. APPLE WATCH SERIES 2. 38 mm Case. GOLD Aluminum. This watch has been factory reset to it original setting. apple iwatch series 1. Condition is Used. Shipped with USPS Priority Mail. The screen is not cracked it is a screen protector, got a new phone so the watch doesn’t match anymore. The Official Apple Watch Series 1 Smartwatch. 42mm version with Space Gray Aluminum Case and Black Sport Band. (MP032LL/A) Model: A1803. Requires an iPhone 6 or later with iOS 11 or newer. 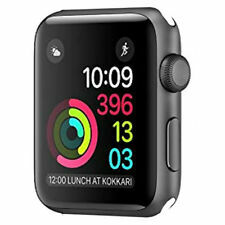 This watch can be used as a Wi-Fi only device for certain features and does not require network connection, although an up to date iPhone will still be required. Apple Watch 38mm aluminum case with a white sport band and an extra black sport band. The case is still in the box with the protector in place. Ready to use with your IPhone. Activity and Heart Rate Monitoring, Changeable Faces with Widgets. Bluetooth 4.0, 802.11b/g/n Wi-Fi Apple watchOS.